Maintaining an online presence is important for businesses of all sizes. Yet who has the time to build a website? You’re busy actually running your company. If you can carve out just a half hour, however, you can establish a professional online presence for yourself or your business for free, with the following easy-to-use tools. 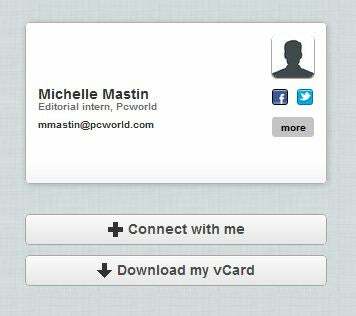 Cardcloud creates a simple website with links to social networks and a downloadable vCard. In a previous article looking at digital business cards, I checked out a site called Cardcloud. In addition to providing a mobile app for you to exchange information, business-card style, Cardcloud turns your public card information into a URL for easy sharing online. The page consists of your business card on a simple background; viewers can click on the icons for any social networking sites you've added to your card. Other Cardcloud users can click the 'Connect with me' button to send you their card, and the 'Download my vCard' button lets visitors do just that. Pros: This app's setup is dead simple--it's your business card, online. Cons: You can't really add much to a Cardcloud profile. It represents your business card with clickable social links, and that's all. Who is it for? Cardcloud is perhaps the quickest way to make sure you exist on the Internet. All you have to do is fill out a few simple contact fields, and you have a website. If you download the mobile app, you also get a quick way to share that information with other people. Billed as "your personal website and contact hub," DooID provides both free and paid plans for putting your information online. The free version is limited (fewer themes and options), but the paid version costs only $36 per year, which is still significantly less expensive than hiring a Web designer. You have to fill out a lot of information, but don't worry: You can pick and choose which details are publicly available. The service then creates a guest password that you can share with anyone you want to give access to your private information. DooID offers many design choices, but only a few are free. The interface is clean and easy to figure out, although it's a little slow to load the various editing elements. It connects to well over 50 services, pulling together your various online identities. You can choose among several free themes, and customize the backgrounds and colors. Once you've set up your website the way you like, DooID will promote it via Facebook, Gmail, Hotmail, LinkedIn, or Twitter. DooID also provides quick options for setting up an email signature or submitting your new URL to search engines to index, plus HTML code so that you can link back to your website in comments on forums or blogs. DooID creates a mobile-friendly version of your website, too, complete with a QR code; people can then scan the code and visit your site on their smartphone. Pros: DooID creates a more full-featured website than Cardcloud does, with links to tons of services. The promotion tools are also handy. Cons: More than half the options require an upgrade to the premium version. Who is it for? If you want something a little more substantial than an online business card, DooID fits the bill while still providing a downloadable vCard. Folks who need flexibility to select the information to be shared will also like this service. About.me is another service that allows for quick and easy setup of a simple website to let the Internet know you exist. It has a comparatively smaller list of services that you can connect to, but still plenty enough for you to tell people where else you are online. About.me's editor is simple to work with. The design is minimal, with one large background image and a small block of text that you can move around the page. You have 17 stock backgrounds to choose from, or you can upload your own image. Services show up as clickable buttons; when a visitor clicks them, they open your tweets, Facebook updates, blog posts, and other similar content in a pop-up. You can also add Web links that will open in a new tab. The only contact information the page will display is a button for visitors to send you email; the feature opens a pop-up for a person to send you a message, keeping your email address private. Basic page-view statistics are also included. About.me will report total views, clicks, and links, and it will even pull in your Klout score for reference. Cons: The resulting page is a little too minimal for my tastes, but the basic design may not be a drawback for everyone. Who is it for? About.me makes it easy to create a nice-looking personal landing page. It's streamlined and uncluttered, and it can give you or your business a professional-looking Web presence for free. About.me is great for people who already have Facebook, Twitter, or blog streams they want to link to, but not a lot of time to mess with Web-page setup. Flavors.me takes social linking a step further, pulling in your assorted information streams. For example, when one of your visitors clicks on the Twitter link, it doesn't take that person to Twitter; instead, the action displays your tweets in a panel on the right side. This means that visitors to your Flavors.me page can read more about you without having to leave the site. You can choose one of your services to open automatically so that your page is already populated with content, or you can leave all the services closed for a more minimal look. You can get started for free, and add premium services for $20 per year. Flavors.me pulls content from your other sites to add to your page. Setup is easy--all it takes is entering your email address and then picking a username and password, after which Flavors.me gives you a blank page. The editing tools sit in a small box that you can move around the page to keep it out of the way. When I tried the service, after adding a quick bio to the welcome section, I simply moved on to added content streams. Flavors.me integrates with 31 other sites, including Facebook, Twitter, and several popular blogging tools. Although Flavors.me gives you eight color schemes, supplies four different layouts (more in the paid version), and allows you to upload a background, it offers no stock backgrounds. The free tools are sufficient to set up a well-rounded profile site; if you're willing to pay, though, you'll get a contact form, a custom favicon, the ability to add custom content streams, a custom domain, real-time stats, and inclusion in the directory. Pros: Pulls in content so that people can read more from you without having to leave your page. Cons: Has more-limited design options, even when you consider the paid layouts. No stock backgrounds. Stats and contact forms are available only for pay. Who is it for? Flavors.me is great for professionals who already have established themselves on Twitter or a blog service, and who would like to have those updates pulled into a quick personal or business landing page. It's also good for people who want more-detailed statistics and don't mind paying for them. Cardcloud and DooID are suitable for putting your contact information on the Web. Cardcloud comes with the added bonus of having a smartphone app for sharing that information as a business card, while DooID makes it easy to choose which information to share and which details to keep private. For personal or business landing pages, About.me is quick and attractive, but Flavors.me offers more contact and statistics options if you don't mind the small fee. While both pages have a clean look, Flavors.me offers the option to have a social stream open right away if you want your page to look more full. If you need a more full-featured site than these tools provide, check out our roundup of website builders. Another option, if you’re already on Facebook regularly, is to create a Facebook page for your business; this approach will give you more options to interact with your customers, but it will also take more setup time. Michelle Mastin has been a freelance musician and teacher since leaving conservatories five years ago, and a hobby nerd forever. Watch classical music and modern gadgets collide at her blog, or follow her on Twitter @violajack.